9:05 AM- So I was in the mess hall last night and heard Neelix giving B'Elanna, Tom, and Harry some advice about warp field theory. No good can come of this. 11:13 AM- Apparently Tom Paris achieved a simulated Warp 10 in the holodeck this morning. What is happening? I mean, I know B'Elanna's a brilliant engineer or whatever but really? Just the three of them? They managed to do what Starfleet's been trying and failing at for longer than I've even been alive? I just can't even. 1:26 PM- Well it's going around. The rumor is that the captain is going to let Paris take out the shuttle for a Warp 10 test flight. I know what I said earlier but I'm actually pretty excited about this. I mean... what if it really happens? If it works we can all go home! 5:17 PM- Holy Crap! He did it. He got Warp 10! There's a party in the holodeck later. 10:30 AM- I heard B'Elanna and Tom in the mess hall this morning talking about another test but then Tom suddenly keeled over and looked like he'd been poisoned. They took him to sickbay. I wonder what's going on. 2:20 PM- I ran into Kes in the hall and I guess Tom's turned into some kind of monster thing. I mean, she didn't say monster, obviously. But from the way she described him... gross. 5:43 PM- We're on Red Alert. I was in engineering when The Doctor decided to try some kind of treatment to fix Tom (he really is super gross) and he suddenly up and took off. He got to Deck Six and found the captain and I guess he just ran off with her. Now we're searching for both of them but who knows how long it'll take. He left our space going Warp 10. 12:00 PM- The captain and Tom are both back. Everything's pretty much back to normal. They're in sickbay recovering and no one has any idea what happened to them or how and why they're both alright now. It seems like, once we found them, it only took about five seconds for The Doctor to fix them and, I mean, I'm not saying I know how bad they were but I heard they were in a real bad way. Real bad. And, ok, I know this sounds completely crazy but I swear I heard it from Wildman who got it from Carey who overheard Chakotay telling B'Elanna that (and, believe me, I know how ridiculously impossible and insane this sounds) Tom and Janeway had turned into some kind of salamanders when our team found them. SALAMANDERS. Seriously. And not only that but apparently they had enough time to reproduce while they were down there for three days. I can't believe I'm even recording this log right now. There's no way this is what actually happened. Right? 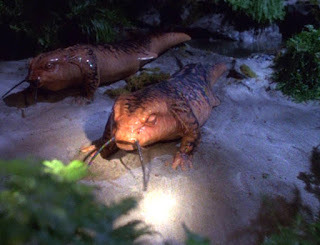 I mean, honestly, if going to Warp 10 turns us all into salamanders but The Doctor can just turn us all back into humans, why not just use the tech to go back home? We might be salamanders for five minutes but isn't that worth the price of being home tomorrow? I don't know. I guess I shouldn't even be asking these questions. This whole thing is clearly above my pay grade. Before the episode goes completely off the rails, it really is all about 1:27pm. The introduction to the wonder of it was pretty amazing. The "abandon ship-no-out-the-airlock-no-time-for-escape-pods" exit... not so much. I think Brannon Braga himself would laugh at this kind-hearted post. I watched some of the DVD special features for season two, and one of the easter eggs hidden in the menu, had a short interview with him specifically on the topic of "Threshold" and you really do have to feel for the man. He was sooo gracious about acknowledging the failure of the episode, and what else he said was true: he's written over 100 episodes of Trek, and some of them beloved... but write one stinker, and that's the one everyone brings up when your name is mentioned. : ) I still love him. Ha! Yes, I think you're right. Like Spock's Brain, this one is famously maligned within the Trek community. But, also like Spock's Brain, I have a weird kind of affinity for it. I think part of that is that, you know, there are some ACTUAL bad episodes of Trek but both of these are just so wacky and off the rails that I can't really hate them. They're just completely baffling. I mean, how did they even get made? When a prop guy was wrangling a rubber salamander onto the set or when DeForest Kelley was pretending Leonard Nimoy was an RC toy, did anyone really not stop and say, "Wait? Are we really doing this?" Actually, I'm sure someone did but by the time you're on set that's pretty much the point of no return in TV.